SI Joint Pain: Do you have it? There is certainly no shortage of pregnancy aches and pains, and sometimes it can be difficult to determine what exactly it is you’re feeling, and how to address it. One of the most common pains women experience is sacroiliac (SI) joint pain, but often we may not know that’s what it is, and in turn, could try to do things to remedy the pain that could actually make it worse. Here are some tips to help you identify if the pain you’re feeling might be SI joint pain, and what to do to help prevent or manage it. SI joint pain is felt in the backside of your pelvis (around your buttocks), and a tell tale sign is that it’s often felt on one side only. The pain is typically worsened by weight bearing activity, especially on one leg (like stair climbing, doing the elliptical machine, taking an exercise class, or even long periods walking). The pain can range from chronic and dull to sharp and shooting, sometimes radiating down your leg a bit. If you think you may have SI joint pain, speak with your doctor to get a diagnosis. Your SI Joint is located in the backside of your pelvis. When you’re pregnant, a hormone called relaxin continues to increase throughout your pregnancy. This hormone does what it sounds like it’d do — it softens your joints, ligaments, and connective tissues to allow your body to adapt to your growing baby, and to provide more mobility for childbirth. While very useful in that sense, the downside of relaxin is that it decreases your stability, especially in your pelvic region, and essentially makes your SI Joint weaker. 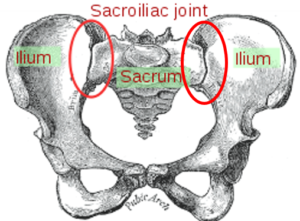 On top of that, the job of the SI joint becomes harder, as it attempts to keep your pelvis in a proper position while your growing belly works against it — pulling your pelvis into a forward-tipped position. Many times the pull from your belly combined with the softening effect from relaxin becomes too much and causes the SI joint to give, stretch, and possibly become hypermobile. This is when you feel the pain. Get in Neutral: One of the best ways to address this pain is to counteract that forward tipped position your belly is trying to pull you into. Work on getting your body into neutral alignment — when you stand, when you workout, and when you go about your day. Strengthen your “Core Canister” and glutes: The other key way to alleviate SI Joint pain is to strengthen the muscles surrounding your pelvis to provide greater stability in this area. This includes the deep core muscles of your Core Canister, and glutes. In addition to mastering 360° Breathing, also work on these Pelvic Floor Activations to strengthen the “floor of your core” (critical muscles in providing pelvic stability), as well as glute exercises like floor bridges. Be careful (or avoid) single-leg weight bearing activity: If you are experiencing symptoms of SI joint pain, try as much as possible to keep your body in symmetry with your weight evenly distributed on both feet. Avoid single-leg movements like lunges, stair-climbing, and cardio machines like the elliptical (even cycling may irritate it, especially if you raise up off the seat). During exercise, stick with weight bearing moves that have your weight evenly distributed on two feet like squats, deadlifts, and floor bridges. Avoid extreme stretching at the hip: With many pains, it’s common to consider what stretches you might do to alleviate it. Unfortunately, since SI Joint Pain is caused by a hypermobile joint (and not a muscle tightness), there are no stretches that will relieve the pain. Moreover, some extreme hip stretches like “pigeon pose” or figure 4 stretches can worsen pain. The best way to alleviate the pain is to focus on the first two points in this list. Avoid sitting cross-legged: Building on the points above, keep your body in symmetry with your feet flat on the floor. Consider a pelvic support belt: These can often provide a great deal of relief. They are pulled on (similar to underwear), or strapped on in some cases, and help to stabilize the pelvic region. Read this post on The Best Maternity Belts from some of our favorite pre and postnatal experts. If pain is severe, speak with your doctor or a specialist: SI joint pain can often be a transient issue. In other words, it’s really bad for a few weeks, and then completely goes away. So, upon first feeling the pain, you can try all the tips above. Working with a pre and postnatal personal trainer can also be a great help, as many are skilled in working with SI joint pain. If pain continues for several weeks, or becomes severe, speak with your doctor, who may refer you to a physical therapist or physiatrist (a medical doctor who specializes in non-surgical pain rehabilitation). If you want more personalized support in developing the proper exercise routine, consider working with one of our NYC Personal Trainers. Outside NYC? Check out our list of PROnatal Certified Trainers.